Sunday morning, and it's picture postcard picturesque. I smell bacon frying for breakfast; a grandmotherly woman is walking her two Yorkies in the park, and singing birds are the only sounds piercing the still air. As I approach the pond I can see the reflection of trees, just beginning to change color, upside down in the water, the water smooth like polished glass. 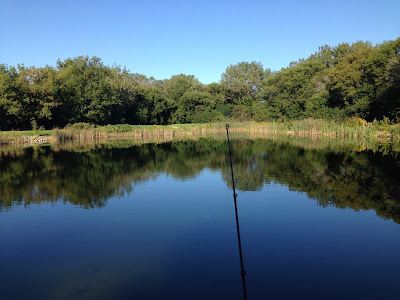 With my Browning SiloFlex in one hand and my vintage 1977 Plano tackle box in the other, I am enjoying the short trek to one of my favorite fishing spots. I'm craving a couple of hours of quiet reflection sprinkled with brief episodes of frenzy created by a few aggressive fish. As I approach the clearing to the pond, I notice a short man, much younger than me, with two fly rods, setting up to fish from my spot. I'm a little miffed, but I take a cleansing breath and decide the morning is too beautiful to let it bother me. The man, resembling Elmer Fudd in his over sized coat and red baseball cap, said, "Just getting started. You fish here much? What do you catch? ", he asks. His voice suggests he wasn't a local. I told him I fish this location quite often, catch bass, bluegill, and whatever else will bite. I reach out my hand, "I'm Bob." "Pleased to meet you, Nate. I'm gonna walk the shore a bit, see if I can scare some fish your way." I walk about thirty yards, dig out a black jig head, slip on a pearl colored minnow tail, and admire my presentation. Soft plastics are the way to go. BAM! First cast, and I am reeling in a fighter! I pull a twenty-four inch Northern Pike out of the water at just the right angle for Nate to see my catch. "I'll teach him for taking my spot," I thought. I nod, and he gives me a thumbs up. I continue down the shore, catching a fish every so often, but also watching Nate work the fly rod. He wasn't catching anything, but he was ultra-smooth with his casting, the fluorescent line arching back and forth over his head. Nate looked like he belonged on the front cover of the Cabela's catalog. I admit to being envious of his skill. The next hour goes about the same as I make my way around the pond. A big bass smacks the water across the way as I return to where Nate is still feeding the yellow line out into the water. We both point at the disruption in the water. He asks how I did, and I tell him that I caught a bunch of little ones, nothing photo worthy. "I'm not catching anything. If you don't mind me asking, what are you using for bait? ", asks Nate. I see my opening, "Tell you what. I'll show you how to catch fish if you show me how to cast a fly rod." He laughs and says, "Deal." We spend the next hour talking tackle, soft plastics, and twitching the tail. I give Nate a new package of Lake Fork magic shad, and he shows me how to keep enough slack in the line to achieve just the right whipping action with his cast. After several unsuccessful attempts, it was evident to me that I would need lots of practice to master fly fishing skills. Nate made it look easy, but casting with the fly rod was tough for me. Breaking a sweat now, I ask, "How long have you been fly fishing? How did you learn how to do this?" Nate explains how he found a great deal on a fly rod kit at a bait shop near his home in Iowa. He purchased the rod and reel because he was always curious about fly fishing, but the sales person didn't know how to use it. "Living in the middle of corn fields, I had a hard time finding a person to show me how to fly fish, so I read a couple of books, and started watching YouTube videos to teach myself. It's taken a couple of years, but I finally feel like I've got this down. I'm tying my flies now. ", he says. "You look like a pro. I think you should be posting your YouTube videos. ", I said. Nate flashed a curious smile but wasn't biting. I said, "Part of honoring, and mastering your craft is teaching others how to do it." I ask Nate to keep casting while I record him with my phone. I upload the short clips to YouTube, and I share the link, along with a few of the original clips to his email address. I thank him for the study material. Nate asks what I do for a living. After explaining that I get paid to be a life-long learner. He wonders what I mean. I explain my craft is teaching and learning. Hearing this, he says, "Well, we are both learning things this morning. Imagine if school was more like fishing." "You said it man! ", as I punch him lightly in the shoulder. "Well my friend, the Bears kick off in about an hour, and I've got to be getting home. Go catch the big one and send me pictures. ", I tell him. "I will do that. See you next time! ", he shouts as I enter the woods, smiling, and heading for home. Education Reimagined identifies five elements of next-generation learning; competency-based learning, personalized / context-based learning, learner agency, socially connected learning, and intentionally open-walled learning. Two strangers found a way to experience next-generation learning at a fishing hole. What will it take for us to immerse our school-based learners in their own unique learning paths? Excellent story, Bob. What a cool example of how learning happens in (Dare I say it?) the real world. Also, now you an I have to go fishing sometime. I fly fish, though I'm terrible at it. Maybe I ought to watch more YouTube videos on the subject. Thanks for commenting. With respects to a fishing outing - you're on!